It is a repository for knowledge ancient and modern in the Beta Scorpii system. The whole planet was covered in buildings, and each major megapolis was dedicated to the acquisition and dispensation of a different branch of knowledge. At least in the past, it served as an academy of learning to knowledge-seekers from anywhere in the universe, filled with scholars, students, and researchers from over a thousand different starfaring races. others unidentified of the "hundreds of thousands" of residents of Rus whose spirits had been formerly trapped within his form (and the Runestaff before that) - possibly including a Deonist, Druff, Grund, Guna, Korbinite, Kronan, Sagittarian, and others I can't identify...can you? 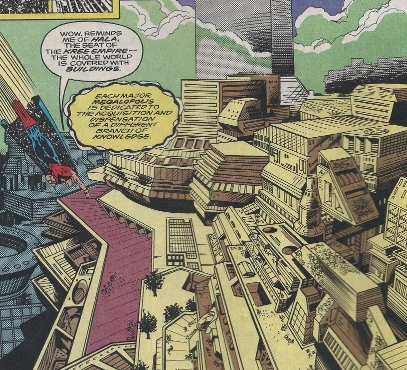 circa Quasar#39 & 49, it had been rebuilt such that the whole planet was covered in buildings, with each major megapolis dedicated to the acquisition and dispensation of a different branch of knowledge. (Thor I#234 (fb) - BTS / Thor I#335 (fb) - BTS) - Kamo Tharnn's adopted homeworld (see comments), Rus, was the sole planet orbiting its star in a distant galaxy, "half a universe away" from the Milky Way (see comments). 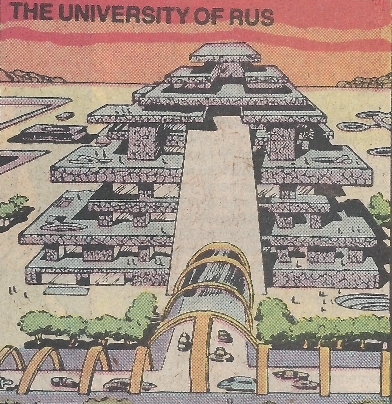 (Official Handbook of the Marvel Universe Deluxe Edition#10: Possessor entry) - Kamo Tharnn founded a huge university and library on Rus, and he transferred the vast store of knowledge he had accumulated to a huge master computer. 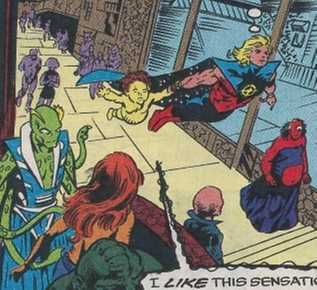 (Official Handbook of the Marvel Universe Deluxe Edition#10: Possessor entry) - Tharnn opened the doors of his academy of learning to knowledge-seekers from anywhere in the universe. (Official Handbook of the Marvel Universe Deluxe Edition#10: Possessor entry) - Within a century, his institution of advanced knowledge was filled with scholars, students, and researchers from over a thousand different starfaring races. (Thor I#335 (fb) - BTS) - Rus long served as an interstellar academy within the local galaxy. Its Master Library housed the most complete bank of data coils within the galactic system. (Official Handbook of the Marvel Universe Deluxe Edition#10: Possessor entry) - For untold millennia, Tharnn was content to be the master librarian and chief administrator of his university...until one of his research assistants brought to him the Runestaff. (Thor I#235 (fb) - BTS / Official Handbook of the Marvel Universe Deluxe Edition#10: Possessor entry) - Tharnn accidentally dispatched the hundreds of thousands of students and faculty (all who lived upon his world) on Rus into the limbo-like pocket dimension "inside the Runestaff. 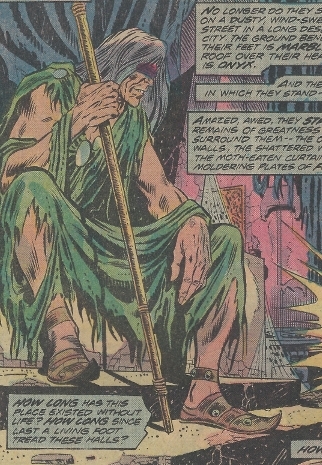 (Official Handbook of the Marvel Universe Deluxe Edition#10: Possessor entry) - Driven further insane by the ruin of everything he had striven for over the eons, Tharnn, now calling himself the Possessor of the Runestaff, presided over the still world, paranoid that someone would come and take away his last remaining possession. The planet's edifices soon fell into disrepair, the master computer ceased to function, and a furry pre-intelligent semi-humanoid race of "Beast-Men" began to breed wildly and overrun Rus. (Thor I#234 (fb) - BTS) - Sif and Hercules arrived on Kamo Tharnn's homeworld, a city of which they found deserted. Sif identified the "eternal beacon" that marked the palace of Kamo Tharnn and led Hercules there. (Thor I#235) - As Sif led Hercules through the labyrinth-like city towards the palace, Kamo Tharnn sent his beast-men against them, but they made short work of their attackers. (Thor I#235) - Tharnn transported them to his presence and questioned their right to be there, leading to a battle, in which Hercules ultimately subdued Tharnn. Sif transported herself, Hercules, and the Runestaff back to Earth. (Champions#13 (fb) - BTS) - Seeking to reclaim his Runestaff, Tharnn began moving his planet across space, eventually bringing it close enough to Earth's sun to feel faint warmth from Sol . (Champions#12 / Champions#13 - BTS) - To stop the Null-Life Bomb, the Stranger (who did not realizing the Runestaff had been brought to Earth), transported Los Angeles' Champions (Angel/Warren Worthington, Black Widow/Natasha Romanoff, Darkstar/Laynia Petrovna, Ghost Rider/Zarathos/Johnny Blaze, Hercules/Alcaeus/Heracles, Iceman/Bobby Drake) to the world of Kamo Tharnn. Hercules swiftly identified the world and the approaching Beast-Men, while Tharnn recognized Hercules' voice, vowing the one who stole his Runestaff would die. (Champions#13) - Tharnn ordered his Beast-Men to attack and bring him Hercules' head. 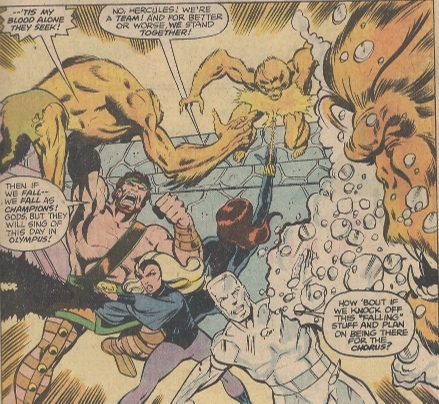 As the rest of the Champions fought off the Beast-Men, Darkstar headed back to Earth via the Stranger's closing portal, and Iceman followed her. Sensing their teammates' departure, Tharnn subjected the others to hellish illusions, but Angel realized the illusion and battered Tharnn unconscious. (Thor I#335 (fb)) - Tharnn recalled the Ritual of Retrieval and reclaimed the Runestaff. (Thor I#335 (fb) - BTS/ Official Handbook of the Marvel Universe Deluxe Edition#10: Possessor entry) - At some point, Rus was relocated to the Scion system in the Andromeda galaxy (see comments). (Thor I#335 (fb)) - Tharnn attempted once again to to master the Runestaff's powers, but only succeeded at transferring the souls trapped within into his own body/mind, leaving himself addled. (Thor I#334 (fb) - BTS) - Tharnn concealed the Runestaff within the walls of his world's Master Library. (Thor I#335 (fb) - BTS) - A prison transport crashed on Rus, and the criminal Kt'kn being transported slew their guards. They encountered and imprisoned the addled Tharnn. (Thor I#334) - Thor, Sif, and Keith Kincaid (Jane Foster's fiancé, to whom Thor had revealed his connection with Blake and who had begged Thor to bring him along) took an Avengers quinjet to Tharnn's world. Overcoming the Kt'kn criminals, Thor flew Sif and Kincaid to Tharnn's palace. Searching the abandoned palace, they eventually encountered an agonized Tharnn, who acquiesced when Thor offered to free him in exchange for yielding to him the Runestaff. Tharnn led Thor and his allies to the Master Library and revealed the Runestaff's hidden location. Sif spoke the ritual, but it failed as Sif found that Jane's essence was not within her. (Thor I#335) - Seeking to reclaim the Runestaff, Tharnn was overcome by the personality of Axor before collapsing. Kincaid convinced Sif to travel within the Runestaff, and Thor joined her in the quest. The Macro-Screen's system revealed Tharnn's history, after which Tharnn was overwhelmed by the personality of Al'Axis, the Philosopher Supreme of the planet Quintar. Kincaid then realized Jane Foster was trapped within Tharnn rather than the Runestaff, and Thor and Sif returned to Rus after finding the Runestaff dimension's inner world's center apparently empty. Sif used the Runestaff on Tharnn, freeing hundreds (or hundreds of thousands) of alien entities (as well as Jane Foster) in a blinding flash. His mind once again sound, Tharnn thanked Thor and vowed the Runestaff would be studied thoroughly and that it would only be used at all when it could be put to good and moral use. Thor, Sif, Kincaid, and Foster returned to Earth. (Quasar#39 (fb) - BTS) - At some point, Rus was relocated to the Beta Scorpii system in the Milky Way galaxy. (Quasar#39 (fb) - BTS) - Over an unspecified time period, the master library was rebuilt. Eventually, the whole planet was covered in buildings, with each major megapolis ("city") dedicated to the acquisition and dispensation of a different branch of knowledge. It became the "tri-galaxy area's academic center." (Avengers Spotlight#24/2) - The members of SHIELD (Society of Higher Interstellar Education and Logistical Development) were members in good standing of the Intergalactic Institute of Advanced Learning on Rus. (Quasar#39) - Seeking information on the Ultimate Nullifier (as Quasar was considering using it against the Magus (Adam Warlock's evil half, who had obtained vast power and threatened the universe)), Quasar contacted Epoch (spawn of the cosmic entity Eon) for information. Epoch guided Quasar to Rus in the Beta Scorpii system. Uncertain of where to start, they landed at the largest nearby building, intending to ask directions, but a Solon recognized the threat of the Ultimate Nullifier that Quasar held, and those nearby began to flee. Taking semi-humanoid form (which he recognized the predominant form there), Epoch failed to allay the fears of those present, but was able to scan the minds of those present to ascertain that information directories were present within virtually every major edifice. They flew into the information directory and to a desk, but the Ergonese clerk there told them there was no cutting in line. Quasar tried to explain the urgency and the threat to the universe, but the clerk gave them some forms to fill out to expedite the processing of their use privileges. Epoch filled the forms nearly instantly, the clerk gave them their access disc, and Epoch led them to the master data directory. 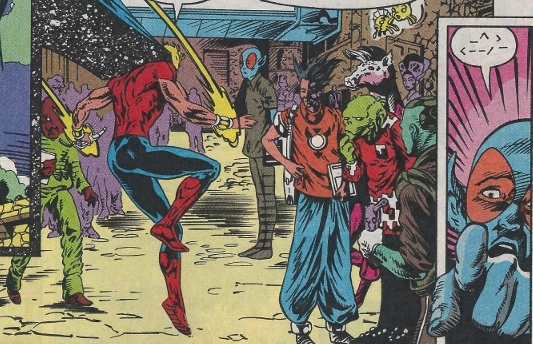 Swiftly accessing the computer system, Epoch began the search, while Quasar battled Deathurge, who had come to force Quasar to accept that he would nullify himself along with whatever his target was if he used the Ultimate Nullifier. Their battle damaged some local real estate, and Gairhee noted Deathurge's powers with interest, while his friend, apparently a member of some aquatic race, was more interested in self-preservation. After Deathurge's departure, Epoch revealed the limited information available on the Nullifier and then decided to stay behind on Rus to learn as much as possible from the Master Library's information archives. (Quasar#49) - Epoch estimated that she would master all of the knowledge the galactic learning center has amassed in approximately 67 more Earth days. After that, she planned to journey to other galaxies within their Local Group (see comments) to see what knowledge depots they might house. (Quasar#49) - On Rus, Epoch gave a lecture stating "the Vrellnexian paradigm states that every single action by every single organism causes reality to diverge within its own phenomenal field, creating interference patterns between adjoining fields. This, in turn, keeps the fabric of existence folding in on..."
Just then Quasar teleported in, asking how to cure cancer (as his mother was suffering from breast cancer). A Megan spoke up, noting how he had studied the history of xenopathology for a few sun-circles, and discussing how the physicians of Farquar gathered together all of the known strategies for treating cancer. Unfortunately, upon testing them, the physicians found that none of these treatments worked in every case nor were they successful when used on other species, as cancers cells adapt to each..." Frustrated, Quasar cut him off and teleported away. Ultimately, Quasar's mother suffered from a (at least at the time) localized form of breast cancer, and surgery and adjuvant therapy apparently kept it under control at the time. Comments: Created by Gerry Conway, John Buscema, and Joe Sinnott. Named and history revealed by Alan Zelenetz, Mark Bright, and Vince Colletta. 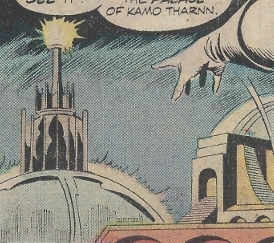 The planet visited by Sif and Hercules in Thor I#234-235 is referred to both as Kamo Tharnn's homeworld (in narration) and as the world Kamo Tharnn had chosen to live. They're not mutually exclusive, but the former implies he was born there while the latter implies he later relocated there. Thor I#335 identified Rus as Tharnn's adopted homeworld. I think that's most accurate. In #235, Rus (unidentified at the time) is described in the following passage: "half a universe away, in a galaxy as far from the Milky Way as our sun is from Andromeda, is a world revolving around an ancient star." I confirmed with Gerry Conway that this is meant to refer to a relative distance, something like "as many of Earth's sun's diameters are b/t Earth's sun and the Andromeda galaxy = the number of galactic diameters b/t the Milky Way galaxy and Rus' galaxy"
Doing some searches (assuming internet info is correct...), it would appear the Milky Way and Andromeda galaxies are about 2.7 million light years away; and that Earth's sun is about 20,000 light years from the edge of the Milky Way galaxy, which would put Earth's sun either 2.72 or 2.78 million light years from the Andromeda galaxy. If the sun is 1.4 million kilometers in diameter (which would mean something like 7.1 million of the sun's diameters in a light year (10 trillion kilometers)...which would mean something like 19 trillion sun's diameters b/t Earth's sun and the Andromeda galaxy. If the Milky Way galaxy is 100,000 light years in diameter, that would mean that Rus is supposed to have been 19 trillion times that galactic diameter....which would put it at 1.9 quintillion (1.9 x 1018) light years away from the Milky Way galaxy. Some sources try to plug a distance into the size of the universe, others consider the universe infinite and/or discuss the apparent size of the observable universe. See the discussion below. Some sources list the size of the observable universe at around 47 billion light years...which is nearly a billion times smaller than the estimated distance to Rus' galaxy. So, perhaps the whole universe is insanely bigger than what we can observe, or perhaps the description is a bit of hyperbole? I meant it as literally as one can mean something on that sort of cosmic scale...I was referring to "relative" scale/distance, if relative's the right word at such Einstein-boggling distances...which, as you point out, is really, really far. Going cosmic in the 70s meant going COSMIC. So, yeah, far. So, whether the statement is truly accurate or hyperbole, the bottom line was, in this story, Rus was meant to be in a galaxy extremely distant from the Milky Way...far, far beyond the Andromeda galaxy. 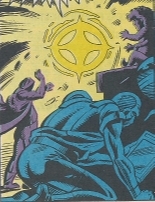 The Official Handbook of the Marvel Universe Deluxe Edition#10: Possessor entry identified Rus as being in the Scion system, in the Andromeda galaxy. Presumably that refers to its location as of the most recent story at the time, which was Thor I#335. In Quasar#39, Rus was identified as being in the Beta Scorpii system, which is in the Milky Way galaxy, around 400 light years from Earth. So...it would seem that Rus was originally in some crazy distant galaxy on the far side of the universe in Thor I#235, then brought close to Earth in Champions#12-13, then relocated to the Scion system (Andromeda galaxy) as seen in Thor I#335, then relocated to the Scion system by Quasar#39. By the way, in Fantastic Four Annual #19, Mr. 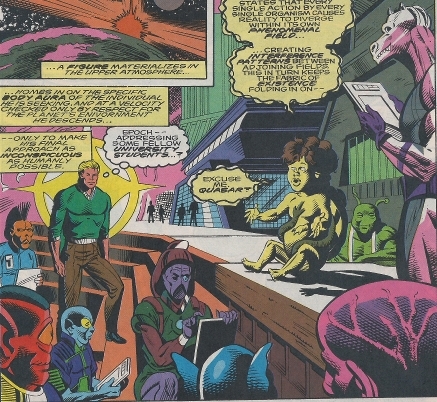 Fantastic states that the planet of the Elan is in the Beta Scorpi sector of our galaxy, and that there are at least three Skrull outposts within a hundred cubic parsecs of it. 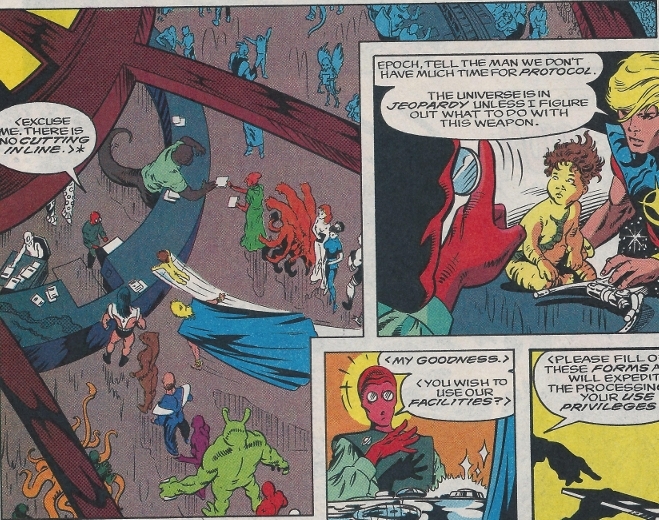 Then again, he also claimed that the Skrull Empire had occupied "all the suitable worlds within of their home galaxy, M-61 in Andromeda." That is WAY wrong. M61 is a spiral galaxy in the Virgo Cluster which is about 52 MILLION light-years away from Earth. As such, M61 is not only MUCH farther away than the Skrull galaxy (stated to be two million light years from Earth on the annual's last page), it is also in the constellation Virgo which is NOT part of Andromeda or even close to it. Reed may be a genius in many fields but his astronomical knowledge is clearly lacking (at least for this story). Or maybe it's just that some comic book writers are REALLY bad at science. And, thanks to Don for his insight on astronomy, as well as for identifying the quoted information from Epoch's projected plans in Quasar#49. My book mysteriously vanished for several days! The "Local Group" seems to include the Milky Way and Andromeda galaxies, as well as M33 (which has been speculated to be the Shi'ar galaxy despite a misnaming of it in Annihilation prologue#1 as M31, which is actually the Andromeda galaxy), the Greater Magellenic Cloud (home to the Shi'ar Empire). Different sources list more than 20, approximately 30, or nearly 40 galaxies in the Local Group. Other sources specify 20 bright galaxies and 30 total. The universe may be viewed in two ways, as the Universe and as the Observable Universe. The Universe itself, per the modern scientific understanding of it, is infinite and ever expanding. There is no true "center" or "edge" to the universe. The Observable Universe is the finite portion of the universe we are able to observe from Earth, which is currently a sphere with a radius of about 47 billion light years. "The Universe (all the planets, stars, dust, galaxies etc) is NOT expanding into a void of empty space; it is space itself that is expanding and moving everything in it. Of course, galaxies, stars, planets and the rest have their own motions, known as "proper motion" as Earth orbits the sun, the sun orbits the Galactic center, and the Galaxy moves toward the Andromeda Galaxy etc. All this is overlaid on the underlying expansion of the fabric of space. As space expands, it pulls all the matter with it. Thus, the further apart two objects are, the faster they appear to recede from each other. Eventually, objects are so far apart that the expansion rate, viewed cosmologically, is more than the speed of light, and we can not see them at all. This is not a problem because it is not MOTION faster than light. The fabric of space is not matter so it can do as it pleases, including expanding faster than light-speed. Matter just gets taken along for the ride, but does not conflict with the rules of relativity. In fact, while the Universe is around 13.73 billion years old, our horizon is a radius of approximately 46.5 billion light years (14 Gpc). This is approximately 2.7x1023 miles! I have included a brief explanation of this apparent paradox using the "Ants on a Balloon Analogy"
Firstly, imagine that our three dimensional Universe is represented as the two dimensional surface of a balloon; not the interior, just the surface. It starts off deflated. There are two ants on the surface, Andy and Boris, and they are two cms apart. Andy starts to walk towards Boris (who remains stationary) at two cms per second, while the balloon inflates. We measure expansion on the balloon's surface as a velocity-per-unit-distance; let us say that it's half a cm per second per cm. This means that as Andy is 2 cms away from Boris, Boris expands away onecm per second. So, after one second, Andy has moved two cms towards Boris, but Boris has expanded away from Andy's starting point by approximately one cm, so Andy is still about one cm away from Boris. The expansion continues as Andy walks so it takes just over half a second more to reach Boris. Andy now looks back at his starting point, that was two cms from Boris. After just over one and a half seconds, it is now just over one and a half cms FURTHER away, so the start point is now just over three and a half cms away, and moving further all the time at an ever increasing velocity, now at over 1.75 cms per second! If you prefer Imperial measurements, just substitute inches for cms!" As for the mention of the Universe having a measurable radius of 15 billion light years, this is apparently based upon two misconceptions. The first misconception is that the Universe was thought to be about 15 billion years old, which has been updated to the more accurate 13.7 billion years old as of NASA's WMAP probe of 2003. The second misconception is that the Big Bang occurred at a central point and expanded outwards for 15 billion years at the speed of light in a spherical radius of 15 billion light years, but as discussed above, the nature of the expansion of the universe does not work that way. The Beast-Men were super-strong semi-humanoids of limited intelligence. They typically failed to stand up to any sort of superhuman or super hero adversary, but nonetheless represented an obstacle to get past to confront Tharnn. (Official Handbook of the Marvel Universe Deluxe Edition#10: Possessor entry) - After Kamo Tharnn's experimentation with the Runestaff led to all of its inhabitants being transported into the Runestaff, Tharrn was driven further insane by the ruin of everything he had striven for over the eons. Now calling himself the Possessor of the Runestaff, Tharnn presided over the still world, paranoid that someone would come and take away his last remaining possession. The planet's edifices soon fell into disrepair, the master computer ceased to function, and a furry pre-intelligent semi-humanoid race of "Beast-Men" began to breed wildly and overrun Rus. 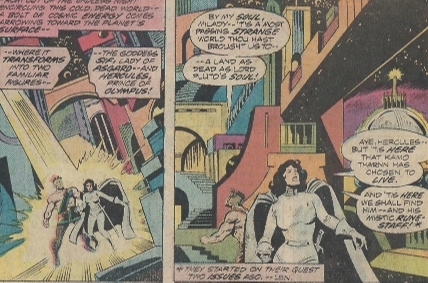 (Thor I#234 (fb) - BTS) - Sif and Hercules arrived on Kamo Tharnn's homeworld and headed towards Tharnn's palace. 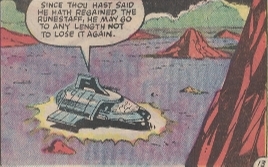 (Thor I#235) - As Sif led Hercules through the labyrinth-like city towards the palace, Kamo Tharnn noted the penalty for their trespass, just before he ordered his subjects to seize them. The two gods were then ambushed by a group of beast-men, but Sif and Hercules made short work of their attackers. Ultimately, the gods overcame Tharnn, stole the Runestaff and returned to Earth. (Champions#13) - Appreciating the unexpected transportation of Hercules to his world, Tharnn ordered his Beast-Men to attack and bring him Hercules' head. 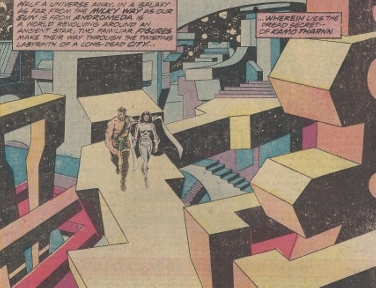 As the rest of the Champions fought off the Beast-Men, Darkstar headed back to Earth via the Stranger's closing portal, and Iceman followed her. Tharnn used hellish illusions to incapacitate the others, but Angel overcame the illusions and battered Tharnn unconscious. 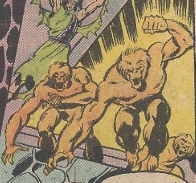 Were the Beast-Men native to Rus, or did someone bring them there as a science experiment? How long did it take for the Beast-Men to overrun Rus after Tharnn first went insane? Were there relatively large populations co-existing separately with the scholars, and this number bred wildly when the scholars vanished? Where the Beast-Men as of Thor I#335? Did the Kt'kn slay them? Did they wander off once Tharnn became addled by absorbing the Runestaff's inhabitants? 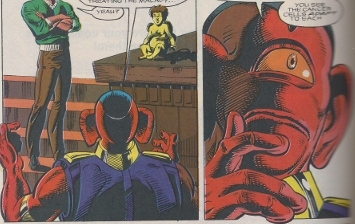 Assuming they weren't exterminated before, what happened to the Beast-Men after Rus was repopulated by scholars and was returned to a more urban society. Given the scholarly nature of those of Rus, I would think it more likely they were either transported elsewhere (rather than being slain) or were educated/mentally stimulated and allowed to remain on Rus? (Quasar#39) - Epoch guided Quasar to the planet Rus to gain information on the Ultimate Nulifier. 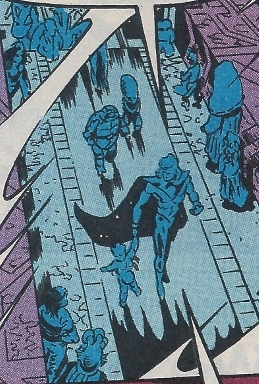 Uncertain of where to start, they landed at the largest nearby building, intending to ask directions, but a Solon recognized the threat of the Ultimate Nullifier that Quasar held, and those nearby began to flee. Taking semi-humanoid form (which he recognized as the predominant form there), Epoch failed to allay the fears of those present, but was able to scan the minds of those present to ascertain that information directories were present within virtually every major edifice. You can see the Contraxian and Solon from the previous panel. The female with magenta? hair and a sleeveless outfit reminds me a bit of Cerise -- I wonder if she might be from someone Shi'ar world? The pale yellow person with the frock of brown hair sticking out the front of the headpiece looks sort of similar to Epoch...he looks too civilized to be one of the Plodex. And I can't identify any of the feet we see as they flee from Quasar and Epoch. (Quasar#39) - Quasar and Epoch flew along a walkway to the information directory. The one-eyed red female looks to be a Megan. (Quasar#39) - Epoch brought them to the information directory and to a desk, but the Ergonese clerk there told them there was no cutting in line. Quasar tried to explain the urgency and the threat to the threat, but the clerk gave them some forms to fill out to expedite the processing of their use privileges. Epoch filled the forms nearly instantly, and the clerk gave them their access disc. The red-skinned clerk with glasses is speaking Ergonese, so presumably he's an Ergon. He has the red skin, but a much different frame than Sklarr, who was a warrior. I thought the first guy in line (dark hair, super hero-esque costume) was one of the Imperial Guard, but I can't match the costume...maybe he's one of the Legion of Super-Heroes? Big green guy with antennae on head looks familiar, but I can't place him. Maybe the guy with wings in the upper periphery is one of the Archeopians? The long lizard tail clerk might fit with one of the Reptoids, but there's not much else in the way of resemblance. I can't place any of the others. (Quasar#39) - Quasar and Epoch used another walkway as Epoch led them to the master data directory. (Quasar#39) - Swiftly mastering the computer system, Epoch began the search, while Quasar battled Deathurge, who had come to force Quasar to accept that he would nullify himself along with whatever his target was. No one here too familiar to me, either. (Quasar#39) - Their battle damaged some local real estate, and Gairhee noted Deathurge's powers with interest, while his friend was more interested in self-preservation. 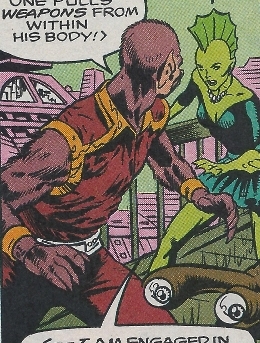 At first, I thought the green woman with a fin on her head might be a native of Arima IV, a green-skinned aquatic race seen in Reality-691's 31st century in Guardians of the Galaxy#25 (1992), but in checking that issue, I see they lacked the fin. Maybe only some of them have fins. Looking at her again, I think she looks a lot like Sea Witch of the Young Gods. Without seeing his face, it's hard to tell if Gairhee (the gray/brown-haired guy with the pointy ears, wearing a brown shirt) is supposed to be murine (rodent-like), simian (ape-like), or pteropine (bat-like). I'd guess the latter. But no guess on what race he might be part of. Maybe the eyestalks belong to a Ciegrimite at the bottom right? Just then Quasar teleported in, asking how to cure cancer (as his mother was suffering from breast cancer). I'd thought the tall, animal-faced guy with the tablet might be Nymenians, but in comparing the two, they don't look that similar. They resemble...something else, maybe something from Avengers Spotlight or Marvel Comics Presents? The green guy with the antenna may be the same guy from #39. Maybe he's a really muscular Elan? (Quasar#49) - A Megan spoke up, noting how he had studied the history of xenopathology for a few sun-circles, noting how the physicians of Farquar gathered together all of the known strategies for treating cancer. 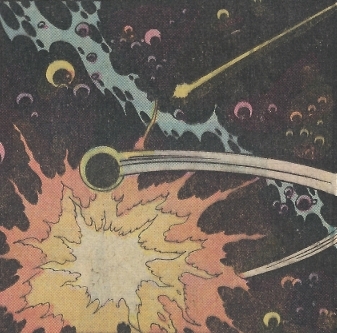 Unfortunately, upon testing them, the physicians found that none of these treatments worked in every case nor were they successful when used on other species, as cancers cells adapt to each..."
(Quasar#49) - Frustrated, Quasar cut him off and teleported away.